As the BBC series starring Aidan Turner returns to our TV screens for its third series in June 2017, Andrew Graham, son of Poldark author Winston Graham, talks about why his father's epic Cornish novels are still so popular today. As the BBC series starring Aidan Turner returns to our TV screens for a third series in June 2017, Andrew Graham, son of Poldark author Winston Graham, talks about why his father's swashbuckling Cornish hero is still so popular today. My father once told me that the Poldark plot could have been written on the back of a postcard. At that time only four had been written, but even so I recall being startled and asking 'How?' His reply was that at its core lies the story of a beautiful woman, Elizabeth, who is incapable of taking a decision and of the consequences of this for the three men, Ross, Francis and George, who love her. Of course the novels take us much, much further than this, not least in the flowering and turbulence of the Demelza/Ross romance. While running alongside and burning all the way through the twelve novels is the ongoing and virulent enmity between Ross and George. I suspect that one of the main reasons people love the Poldark story is that it is so full of characters with flaws as well as passions. Demelza is wonderfully instinctive, warm natured and down to earth and yet it is her ill-judged impetuosity that contributes to Francis’ betrayal of Ross. Elizabeth has poise and beauty yet allows herself to be trapped by the expectations of her family. Ross’ is brave and determined, but his outspokenness at the trial of Jim Carter almost certainly makes Jim’s subsequent punishment more severe. Class, cultures and values are also at stake. George, the cautious, calculating, social climbing, ever profit-seeking banker (except when it comes to Elizabeth) is in constant conflict with Ross, the often reckless, land-owning miner with the entitlement of class that George covets beyond all else. And it is Ross, who, to George’s endless fury and puzzlement, breaks with the values of his class and, still more infuriatingly, earns admiration in the process. The Poldarks are set just after the American War of Independence, soon the French Revolution is underway, and no-one know whether an English Revolution might follow. Nouveau-riche bankers are on the make, mine workers are in despair; the poor demand justice (or at least the food to live), the rich protect their lands, their property and their rules come what may. These were the issues of 18th century Cornwall, but how contemporary they sound! Perhaps the enduring success of the novels and the popularity of the new TV adaptation lie not only in the hopes and fears of Ross and Demelza, but also with the sense of anger that is abroad today. Another reason could be that, despite their meticulously accurate descriptions of the poverty and ill health and class conflict, the novels are written with an enduring sense of optimism. In the closing chapter of his book, Poldark’s Cornwall, my father says he is not 'full of the milk of human kindness', but he goes on to say 'if one balances the coin, [the characters in Poldark are] a little more in the sun than in the shadow'. This, for me, is one of the most uplifting aspects of the Poldark novels. There is always that glimmer of hope and a resilience in the human spirit that is capable of fighting back - against all the odds that life can throw at us. Ross Poldark, the first novel in Winston Graham's epic series is a Kindle Monthly Deal for a limited time, get it on your ereader for just £1.19 here. 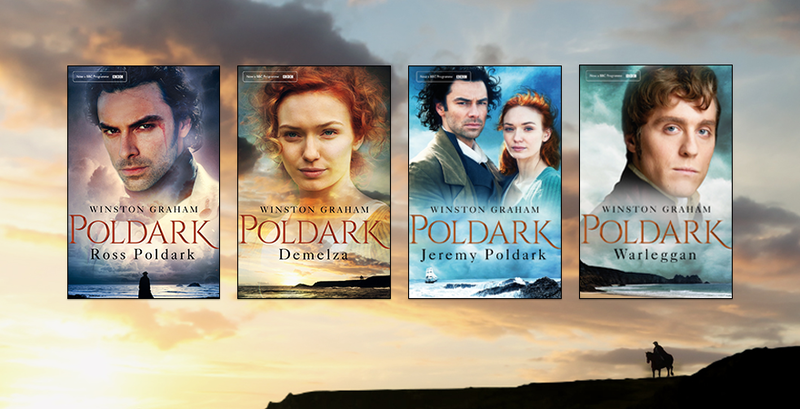 Find out more about all the books in Winston Graham's Poldark series here. Listen to audio extracts from the Poldark series of novels below.